9/11 commemorative graphics wrap...painstakingly replicated. The main challenge with this replica was the complex graphics wrap...but it has proven to be well worth the wait. 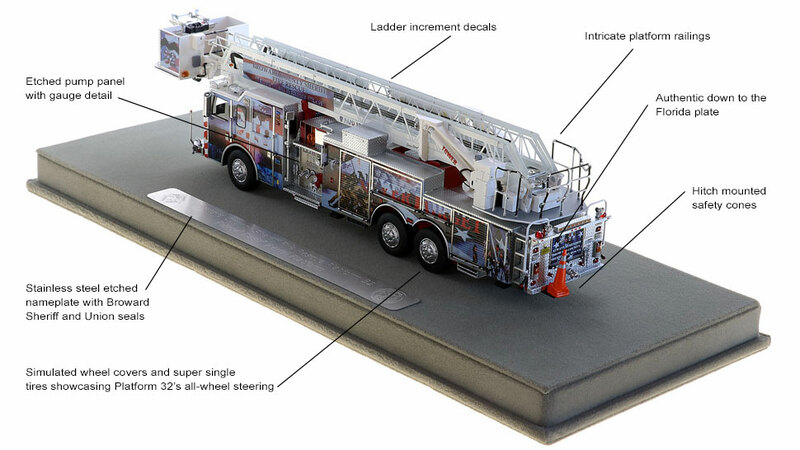 As with each Fire Replicas model, you may notice something new each time you inspect the piece. Over 30 months of development has been invested in the Broward County Platform 32 replica. Countless hours of design, proofing, and improvements make this replica museum grade. Production of Platform 32 is limited to 200 units. 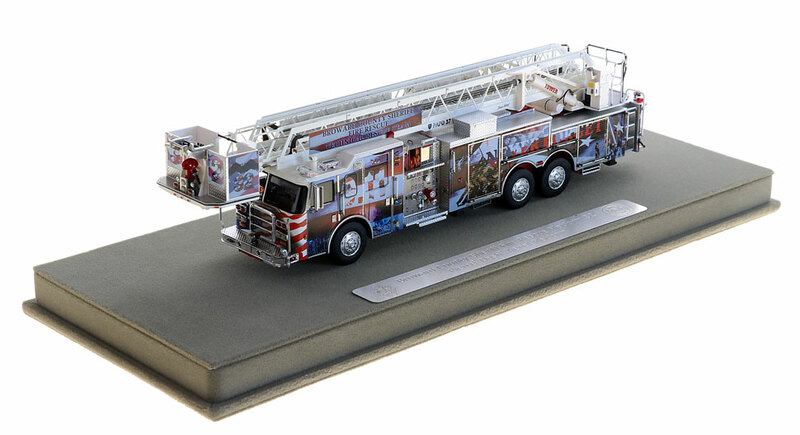 Fire Replicas are designed with the elite collector in mind, and manufactured in limited quantities to enhance future value. Platform 32 measures 12"L x 2.5"W x 3"T and is securely displayed inside a custom case. The case dimensions are 15.25"L x 6"W x 5.25"T and the platform includes an etched stainless steel nameplate with the Broward County Sheriff and Union seals, department and truck name. Multi-materials including High Def Resin, photo etch metal, wire, stainless steel, rubber and other composites. 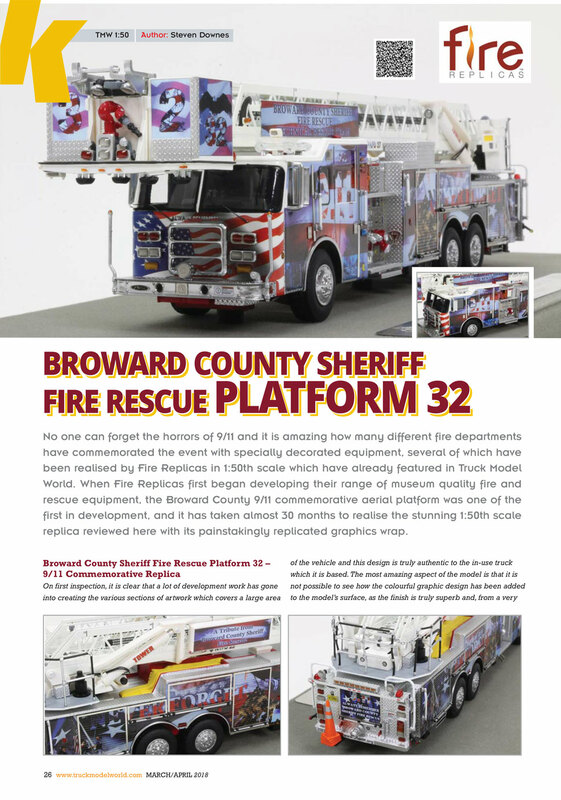 This Broward County Sheriff Fire Rescue Platform 32 scale model is a museum grade replica. 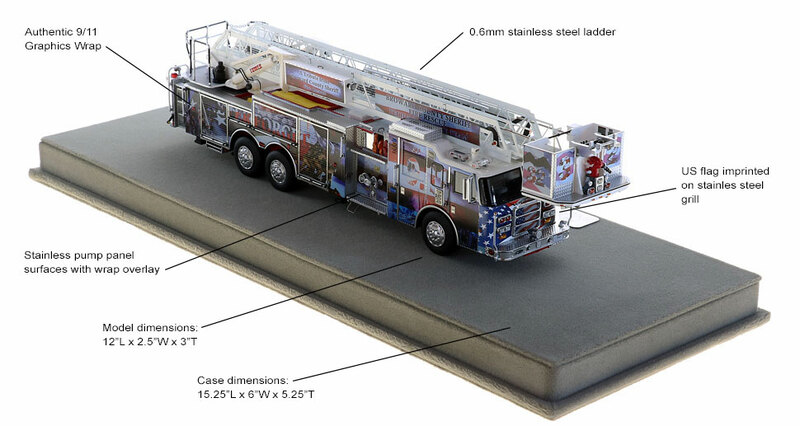 Like all Fire Replicas models, every detail is modeled to perfection and with razor sharp precision. 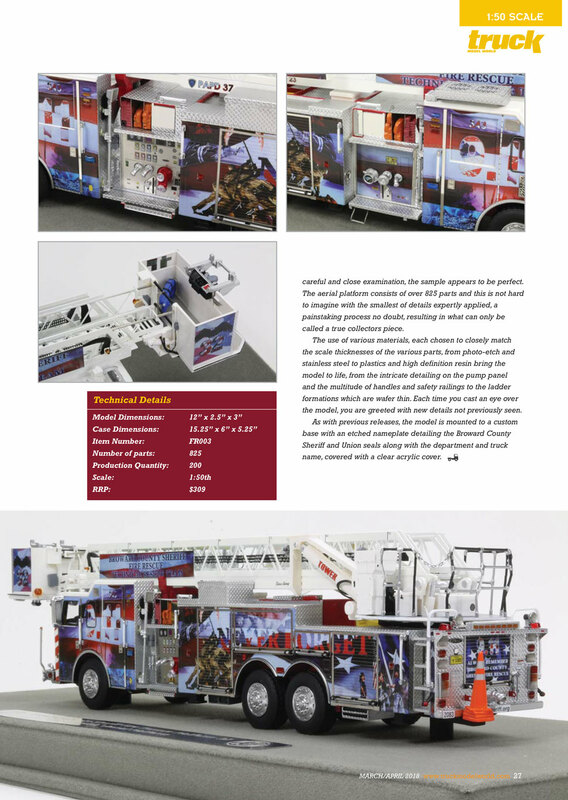 The replica features the specific department configuration and graphics, leaving no detail overlooked. The display case is custom manufactured with high quality acrylic and resin. The stainless steel etched plate features the department seal, and the department and truck name. This replica is a treasure to be displayed and admired and is in no way a toy. I have about 100 fire trucks and fire boats that made by code3, as you probably know they are not making these any more. A very beautiful tribute. Model is also highly detailed. The size and weight of it are impressive. A very worthy piece to any collection. As with all the engines they produce, this piece is fantastic. Proud to have their models in my collection! I know it was a lot of work on this replica but it shows, everyone I talk to that has purchased one can't believe the workmanship and detail to attention that was put in to the Tower Ladder 32 Replica. THE INTRICATE DETAIL ON THIS TRUCK IS HARD TO BELIEVE. THIS ONE WILL HOLD A SPECIAL PLACE IN MY COLLECTION. The Broward County arrived yesterday; it is amazing. The wrap, remarkable in it's own right, could easily carry the rest of the model on it's own accord. Instead, Fire Replicas defined and tweaked additional detail with abundant photo etch, stainless steel ladder, panels and plates, hand shaded hose lays and so much more, putting this model so far over the top it's blows my mind! Fire Replicas does it again with some awesome graphics they nailed this truck. I am glad I was able to get one. Just like all of Fire replicas products, this doesn't disappoint. Another great model that I'm proud to have in my collection. The detail of this truck is unbelievable, down to the safety cones on the rear of the truck. The packaging was first case and I personally liked the hand written note enclosed.